Helps maintain cognitive and brain function / development. Helps decrease symptoms associated with attention-deficit hyperactivity disorder (ADHD) such as lack of concentration. Omega-3 and omega-6 fatty acids are essential to the development and formation of brain cells. Deficiency in essential fatty acids in children is associated with a higher risk of behavorial disorder such as hyperactivity and/or attention deficit (ADHD). Clinical studies have shown that a combination of essential omega-3 and omega-6 fatty acids such as in our product benefits children suffering from development and learning disorder. This specific combination has improved concentration, learning capacity and behaviour in children suffering from ADHD. Note: An orange flavour has been added to reduce bad taste. 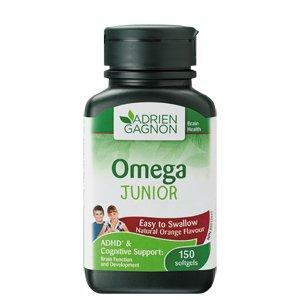 Children having difficulty swallowing softgels can chew them without affecting the efficacy of the product.